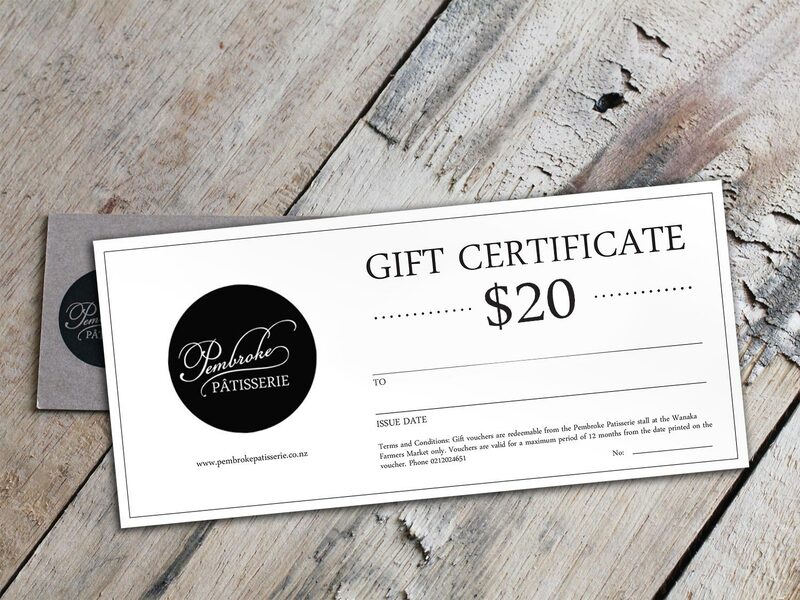 Give a little taste of paradise with a Pembroke Patisserie gift certificate! Give your loved one the gift of pastry with a voucher to spend in our stunning new patisserie in Albert Town. Enjoy all the delights from our delicious range of handmade Pembroke Patisserie pastries, chocolates, coffee and more! If you would like us to write the recipient’s name on the voucher, please put who the voucher is for in the DELIVERY NOTE section. We will email the voucher to you – or directly to the recipient if you desire. Please let us know in the ‘Additional Comments’ section. 1.When Purchasing gift vouchers from Pembroke Patisserie Ltd, you agree to the terms and conditions listed below.2.Gift vouchers are redeemable in store at 20 Alison Avenue, Albert Town and from the Pembroke Patisserie stall at the Wanaka Artisan Market only.3.Gift vouchers are valid for a maximum period of 12 months from the date printed on the voucher.4.Gift vouchers have no monetary value and cannot be exchanged for cash.5.Once purchased, gift vouchers cannot be refunded or returned.6.A credit in the form of a gift voucher will be given for unspent parts of an original gift voucher to cover the balance. 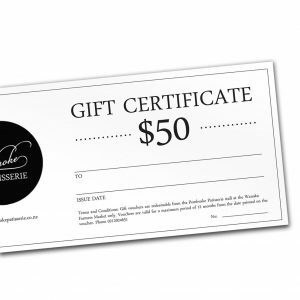 This credit must still be used within the original 12-month period of the date printed on the voucher.7.Gift vouchers can be used as full or part payment to the maximum value of the voucher for goods.8.Under no circumstances will gift vouchers be accepted if they have expired.9.Pembroke Patisserie Ltd cannot be held responsible in the event that a gift voucher is lost or stolen.